Kindle Fire HDX 8.9" Review (2014) - King of all Tablets! Kindle Fire HDX 8.9″ Review (2014) – King of all Tablets! I’ve own probably a dozen tablets including several versions of iPads, Android Tablets, and Windows Tablets. In my opinion, the Kindle Fire HDX 8.9” (2014 edition) is the king of all tablets. It combines awesome specs, great performance, a great user experience, a great ecosystem, and a great amount of value. While it does miss a few features offered on other tablets, and its ecosystem still may come in behind that of the iPad, I believe the Kindle Fire HDX 8.9 is the best available tablet on the market. In this review, I give an overview of the 4th generation Kindle Fire HDX 8.9’s hardware and features. I cover its pros and cons. I also compare the HDX 8.9 against it’s leading competitors. See the Kindle Fire HDX 8.9 review after the break. The HDX 8.9’s build is solid and sturdy. Its light weight and size makes it easy to hold without creating hand fatigue. The body is covered in material that provides a reliable grip. This is unlike my iPad Air which I find quite slippery. The HDX 8.9 is also a bit smaller and weighs a bit less than the iPad, making it easier to hold for long periods of time. The HDX 8.9” offers one of the fastest, if not the fastest processors available in a tablet. The GPU has been upgrade as well. Using the HDX 8.9 is fast. I have yet to experience any lag so far. Its Dolby Atmos compatible audio is definitely a unique and differentiating feature. I can’t wait to get compatible headphones to experience the enhanced sound. While I find the speakers on the HDX 8.9 to be pretty good, don’t expect a Dolby Atmos experience without headphones. The HDX 8.9” interface is simple to learn and use, making it a great pick for kids and seniors. Recently used apps and content are easily accessible via a carousel, which comes in handy when trying to return to the book I was reading. The top menu makes it very quick to find the content you are looking for. Controls are very intuitive. I believe that most people that have used a tablet before will be able to easily navigate the Kindle Fire’s interface. Newbies will find the HDX 8.9 easy to use as well. The web browser is really quick. I believe it’s much faster than the browser I used on the Kindle Fire HD 8.9 I used a couple years ago. Apps launch fast, just as you would expect with such a fast CPU. For those that are more technically inclined, the HDX 8.9” can be hacked to add the Google Play store and other additional functionality. One reason you should consider the Kindle Fire HDX 8.9 over other Android tablets is its great ecosystem. Amazon has a great store for movies, music, and TV. Amazon also has its own app store. While it doesn’t have as many apps as Google Play, I have yet to encounter an instance where I wanted an app and it wasn’t available. Amazon also provides free cloud storage, including unlimited cloud storage for your photos (at full resolution)! It’s a nice benefit to know that all of your photos will be backed up automatically. The Kindle Fire HDX 8.9’s ecosystem is further extended with an Amazon Prime subscription. For $99/year ($49 for students) you get two day shipping on eligible Amazon orders. At no additional cost, you are able to stream or download movies and TV shows. You get “free” access to over a million songs via Prime Music. You also get to borrow some books for free. If you already have Amazon Prime, there are very few reasons to buy any other Android tablet over the Kindle Fire HDX 8.9. The base model HDX 8.9” is a $120 cheaper than a new iPad Air 2. The top of the line HDX 8.9 with 4G is $135 cheaper than the iPad Air 2 with the same amount of storage. The HDX 8.9 is a tad cheaper than the Samsung Galaxy Tab S 8.4 and $100 cheaper than the Samsung Galaxy Tab S 10.5. The HDX 8.9 competes very well on price, while at the same time, offers top of the line specs and features. Add to this Amazon’s ecosystem and Prime benefits and the result is a device that provides a great amount of value over its competition. If you are looking for a few quick points to decide on whether or not the Kindle Fire HDX 8.9″ is for you, look no further! See the Kindle Fire HDX 8.9″ pros and cons below. Here’s a list of pros I feel gives the HDX 8.9 the advantage over the competition. Free cloud storage included. Unlimited cloud storage for photos (full resolution). Rear and front cameras. Not all Kindles have both. Firefly app allows you to identify 100 million items using your camera. Soon you will be able to recognize thousands of movies, TV shows, and songs as well. The HDX 8.9 isn’t without its share of drawbacks and missing features. Here are some of it’s notable disadvantages. Marginal update over last year’s Kindle HDX 8.9” (2013). If you are trying to decide which one to buy, I think spending the 30 bucks extra for the 2014 HDX 8.9 is worth it. It has a faster CPU, faster GPU, faster Wi-Fi, Dolby Atmos audio, and a SlimPort enabled Micro-USB 2.0 port that supports HDMI and VGA connectivity via an optional adapter. I plan to get the HDMI adapter so the 2014 is definitely my choice. Should you upgrade from the 2013 Kindle Fire HDX 8.9 to the new 2014 version? Unless you are reselling or re-gifting the 2013 HDX 8.9, it’s totally not worth it to upgrade. For most typical uses, these devices are largely the same. The Samsung Galaxy Tab S 8.4 is probably the best Android alternative to the HDX 8.9. It offers comparable specs and price. It has an SD card slot and fingerprint reader while the HDX does not. It also run stock Android. Some people will find this to be a huge advantage. Ultimately the Hdx 8.9 beats the Galaxy Tab S due to its ease of use and the extra value provided by the Amazon ecosystem. With the Galaxy Tab, you get a tablet. 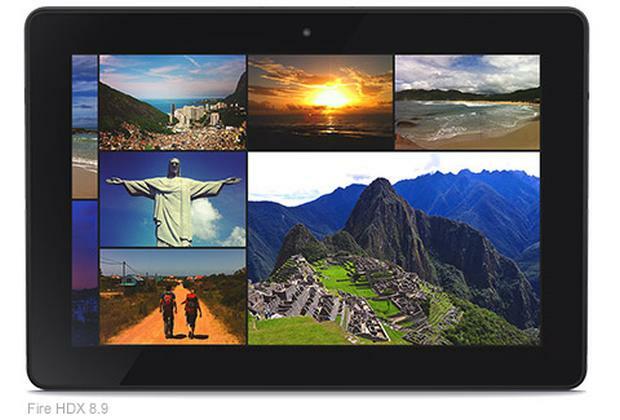 With the HDX, you get a tablet, free cloud storage, and unlimited photo cloud storage. You also get a nice app store, music store, movie store, and book store. If you add Amazon Prime, you get access to “free” movies, music, and books. I have several Windows Tablets and convertibles in the house and none of them beat the Kindle Fire HDX in terms of a pure tablet experience. However, if you want the ability to run desktop apps on a tablet, nothing beats Windows Tablets. Thus, the decision comes down to how much you plan to use your tablet as a computer. I do believe that Windows Tablets such as the Microsoft Surface Pro and others can someday rival the iPad and Android Tablets in terms of a pure tablet experience. Unfortunately, Windows Tablets currently see a big gap in terms of usability, available apps, and price/performance ratios. IPad users enjoy probably the best ecosystem of apps, accessories, and exclusive content. Niche apps are often made first for, or are exclusive to iOS. iPads have seen more support in the enterprise and in educational institutions. In addition to all of this, iPads are also great devices. If you have a Mac, use an iPhone, require apps or content exclusive to iOS, are already invested in iTunes purchases, or any combination of the above, you are probably better off getting an iPad. However, if you are open to considering another device, the Amazon Kindle Fire HDX 8.9 should be at the top of your list. It’s a great device, it’s cheaper than a new iPad, and offers a lot in terms of ecosystem and optional benefits. Ultimately, I chose the HDX 8.9 over the iPad because I’m an Amazon Prime Member and I enjoy having access to so much “free” content. How do I Rank it? No other tablet offers the same combination of great specs, great performance, great interface, AND great value of the Kindle Fire HDX 8.9. Period. If you need a tablet, you need the HDX 8.9. Unless you require capabilities exclusive to the iPad (Touch ID, some exclusive apps and accessories, enterprise support, etc. ), you really should consider getting a Kindle Fire HDX 8.9. It has the same or better specs, same popular apps, and costs up to several hundred dollars less than the iPad Air 2, depending on the configuration you choose. When it comes to other Android tablets, it’s a no brainer. The HDX interface is better, its ecosystem and optional benefits are better, its performance is the same or better, and its price is the same or better. Do you agree that the 4th generation Kindle Fire HDX 8.9 is the king of all tablets? Do you think the HDX 8.9 is the best? Do you plan to buy one? Will you buy another tablet instead? Let me know in the comments section below.